This week my family went on our annual frugal summer vacation, and this years destination was St. Augustine, Florida - the oldest city in the nation. 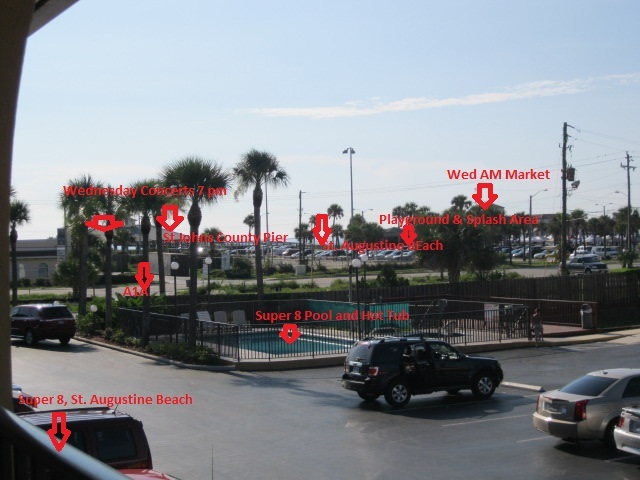 We stayed at the Super 8 St. Augustine Beach, and it surpassed our expectations by far. All of my preconceived notions about the Super 8 chain were put to shame, and our stay at the Super 8 St. Augustine was more pleasant than other stays we have had in expensive hotels. After checking out Hotwire and Priceline, I decided that using these discount sites would not work for me, as my family wanted to stay on the beach, and the St. Augustine beach area on these sites were simply to large to be able to narrow down the right hotel for us. I checked out a few of the larger hotel chains, and I even made a couple of calls, but none of them had the price that I was looking for. When I finally decided to check out the Super 8 St. Augustine Beach, I was surprised to see all of the great reviews on both Tripadvisor and hotels.com, so in the end I decided to take a gamble, and I booked the Super 8 in St. Augustine Beach for three nights. We paid $59 per night + tax, and I booked through Hotels.com and Mypoints to get points back and credit toward a free night stay. Although my family lives only miles away from the beautiful South Florida beaches, I wanted to be able to walk with the kids to the beach in the early morning hours. The hotels on the beach were out of our price range, or they got too mixed or poor reviews. The hotels in the historic St. Augustine were much more affordable than any of the beach hotels, but I did not want to compromise on the location. The Super 8 at St. Augustine Beach is located across from the beach with A1A in between (see the photo above). While you do have to cross A1A to get beach access, it is a very short walk, and the location is perfect. The St. John's County pier is located just across from the Super 8, and in the same plaza you can find a playground with splash area. The beach is perfect with a beautiful sand beach, shallow water and it is a great family beach. In the morning and the evening the tide covers most of the beach, but by 6 a.m., you have plenty of beach area to play on. On Wednesdays the St. John's Pier is booming with activities, as there is a farmer's market in the morning, and at 7 p.m. there are free concerts. The Super 8 in St. Augustine, Florida is a very affordable Florida hotel, especially considering the prices of the surrounding hotels. It is a smaller hotel with two floors, two buildings and 50 rooms. The Super 8 in St. Augustine Beach, was built in 1989, and it underwent a renovation in 2001. It is in great condition, the bathrooms were nice, clean and well-kept, and I was positively surprised about the great condition of the hotel room. The outside of the hotel is nicely kept as well, and compared to some of the surrounding hotels on St. Augustine Beach, the Super 8 seemed to be in great condition. Our hotel room included a nice sized fridge with a small freezer section, a microwave, coffee machine, hair dryer, alarm clock, telephone and a nice sized television with basic cable. The Super 8 in St. Augustine Beach has free WI FI, and although it was on the slow side, it was easy to set up and worked better than in many other hotels that I have visited. Housekeeping came by every day while we were out, they vacuumed, tightened up and did a quick cleaning, including providing new towels. We had no complaints about the housekeeping, and everything was kept nice and clean. The pool area was kept clean, and since my family only visited the area in the early morning hours, we did not experience any crowds. The water was warmer than the beach area, and our kids enjoyed the pool alot. The only minor complaints that my family had about the Super 8 in St. Augustine Beach were that the air conditioner was difficult to set at a good temperature as it either made the room too cold or too hot, and that the pool area was too exposed as it was right by the parking lot and the busy A1A. With a little targeted landscaping this latter problem could easily be solved. No privacy from the street and parking lot when in the pool. If you book ahead, you can save 15 percent off the price. Shop through Mypoints and you will get 2 points per dollar spent at Hotels.com. If you do not have a Mypoints account (free), you can also go through Ebates (free) and get 3.5 percent back when you shop at Hotels.com. If you are a spur of the moment traveler, make sure to pick up a <="" style="font-family: Verdana,sans-seriftarget=;" travel="">Florida Travel Saver or Roomsaver at one of the high way rest stops. The current rate in the discount booklets seems to be $49 for 1 - 4 people. My family enjoyed our stay at the Super 8 St. Augustine Beach, and we can definitely recommend this hotel to our family and friends. If we ever return to St. Augustine, we will definitely be staying at the Super 8 again. If you expect luxury, go for a more fancy hotel, but if you want a nice, clean and comfortable hotel for your family at an affordable price, while you explore St. Augustine and its pristine beaches, the Super 8 St. Augustine Beach is definitely a great hotel at a great value. For it's price class and star rating, I would give the Super 8 St. Augustine Beach 4 1/2 out of 5 stars. Check out the Super 8 St. Augustine Beach Trip Advisor reviews here. I decided to pop over to this blog and see what you'd been writing about. St. Augustine is such an interesting city. The last two times we have been there it has been way too hot to enjoy all those wonderful sights! We are starting to count the weeks until our first trip to Florida this year! I'm so ready!! Sue, I love St. Augustine, but you are right the sight seing is not for the hot days. We went early before the heat set in, so that helped out a lot. I went to high school in St. Augustine, and this was the first time that I was able to share the city with my family.